At first a leaky faucet repair doesn’t seem that urgent. So it drips a little, what’s the problem? The bathroom is down the hall and no one can hear it. Well, wait until your water bills start to go up bit by bit. 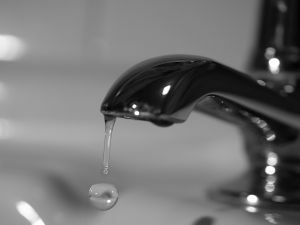 Most people don’t realize how much a leaky faucet can jack up their water bill. It starts out small, just a few dollars here and there, and its easy to miss. However, just a few drops each day can lead to a whopping forty gallons of water per year. If you want a visual image here, one of those standard water bottles that are on top of water coolers are 5 gallons each. So to get 40 gallons of water, imagine eight of those bottles filled to the top side by side. That is a LOT of water wasted. To stop this, call in a plumber early on in the process. The faucet assembly has two threaded extensions that go through the sink with nuts holding the parts tightly in place. Sometimes leaky faucet repair is necessary because the rubber gasket between the sink and the seat of the faucet becomes worn or the nuts holding it become loose. The leak is from water that sits on the sink and seeps through. If this is the case, it may require shutting the water off, loosening the faucet and replacing the gasket. Another under-sink issue that is a factor where leaky faucet repair is concerned is where the water supply attaches on either the hot or cold side. The supply lines screw onto the bottom of the two stems that hold the faucet to the sink. Whatever the reasons you need leaky faucet repair for, you want to make sure you call in the right personnel. Now you can do it on your own, but you will need at least three wrenches, and a lot of patience. There is another option, however, but it involves another tool: your phone. Why? So you can call in a local plumber of course.